1st voluntary contribution to CPF account in 2018. AK has become a bit more IT savvy and he now contributes to his CPF account using internet banking at home. AK has become even lazier in his retirement and will try not to leave home, if possible. Er... You mean how to contribute to CPF account using internet banking or how to become even lazier? Who threw a shoe at me? See related post #1 at the end of this blog. Anyway, I just did my first online voluntary contribution to my CPF account in 2018! This was to my CPF-MA which, of course, earns 4% interest a year. For those of us who are still gainfully employed and paying income tax, contributions to our own CPF-MA will also enjoy income tax relief. For people under 55 years of age who have already maxed out their CPF-SA (i.e. hit the Full Retirement Sum) and for people who are 55 or older, no top up to the CPF-SA is allowed. However, we can still contribute to our CPF-MA if it has yet to hit the Basic Healthcare Sum (BHS). The BHS is $54,500.00 in 2018. Contributing to our CPF-MA if it has yet to hit the Basic Healthcare Sum (BHS) is a good way to earn 4% interest a year. Of course, in the process, this helps us to enjoy "free" H&S insurance too. Last year, I said doing a contribution to our CPF-MA at the start of the year would get us an $88 "ang bao" from the government. For those who still have mandatory contributions to their CPF accounts and hit the BHS in 2017, with the higher BHS in 2018, they can make a voluntary contribution of $2,500 to their CPF-MA now. This means that they will get a $100 "ang bao" from the government! My CPF-MA is lower than the BHS for 2017 because there was a deduction made to pay for my H&S insurance plan last year. Lacking mandatory contributions from being economically inactive means that I would be able to make a bigger voluntary contribution to my CPF-MA. So, my ang bao from the government is going to be more than $100! 1. Online contribution to CPF. 2. Free H&S insurance in Singapore. What will happen to the earned interest of 4-5% if one has hit BHS? If the earned interest will flow to OA and SA, then what will be the allocation for each of them assuming the person has not reached FRS in SA and is below 35? If your SA has yet to hit the FRS, the interest will flow into your SA. If your SA has hit the FRS like in my case, the interest will flow into the OA. can use OA to transfer to MA to hit the max MA? CPFB allows transfer of OA to SA but not to MA. CPF members who are 55 years old and above are allowed to transfer from OA / SA to own or loved ones' MA (once they have the FRS (or BRS with pledge/charge) in their RA. Recipients must also be 55 years old and above. At 55 or older, we can withdraw all our CPF-OA savings in excess of the FRS. So, a transfer from the OA to MA is allowed. It is like withdrawing the OA money to contribute to the MA. I have been reading your blog and follow your method on transfer from IS to SA and top up MA since 2009. I believed in CPF system and also top up my children SA as well to enjoy the 5% interest. For SA top up, I saw some comments in your post someone said top up in early Jan and some said late Jan? Is there a diff? Hey its okay now, i found the answer, so late jan will be relatively better since they calculate by calendar mth balance for cash top up. Sounds like you are taking full advantage of your family's CPF membership. Yup AK you r right, but i calculated, can save one meal (or can buy around 2.5 turmeric powder?) for every 7k (if put in bank for 1% interest) hehe. Every cent counts! I still try to save money here and there but if the difference is micro, I just close one eye these days. Bad AK! Bad AK! I think the portion where the interest income is affected by large transfers due to the timing in the month of transfer or property payment is important. I agree with your view. :) It's just that that small detail is interesting. But yes, it's too immaterial. 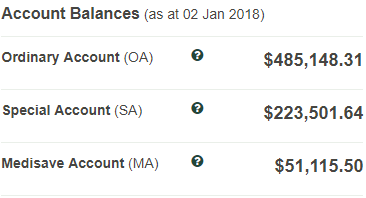 At 55 or older, if you have hit the Basic Retirement Sum with property pledge, will you be able to withdraw everything in the OA&SA?Also, woould it be better to leave it there to gain interest in OA and SA respectively, and only withdraw when needed? Yes, at 55, you would be allowed to withdraw anything (from OA and SA) in excess of the BRS with a property pledge. If you don't have a better place to put the money, it makes sense to leave the money in your CPF till a need arises.